Lawmakers called the actions sickening and infuriating at a hearing that included dramatic testimony from three trailer occupants whose families suspect formaldehyde is to blame for their various illnesses. In May, CBS News chief investigative correspondent Armen Keteyian broke the story of the nearly 86,000 families with rising health problems still living in FEMA trailers across the Gulf. 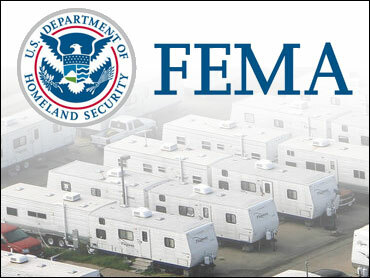 Both Democrats and Republicans bitterly criticized FEMA's decisions to conduct limited inspections or tests of trailers whose occupants reported various respiratory problems. The House Committee on Oversight and Government Reform subpoenaed FEMA records showing that agency lawyers warned officials there could be liability problems if formaldehyde tests suggested negligence on the government's part. The committee's outrage was widespread, backed by internal FEMA emails and memos that only came to light within the last few days. Documents revealed that FEMA officials and attorneys "consistently rejected" repeated calls for testing from its own field staff because they would "imply FEMA's ownership of the issue," reported Keteyian. "It's sickening and the exact opposite of what government should be," said committee chairman Henry Waxman, D-Calif. "It is impossible to read the FEMA documents and not be infuriated." FEMA administrator R. David Paulson apologized to the trailer occupants. "This agency made the best decisions it could with the information it had," Paulson testified. "Now we know we have to do something different than we've done in the past." CBS News has learned that health concerns in FEMA trailers could reach well beyond serious respiratory problems; several deaths may linked to toxic levels of formaldehyde gas, reports Keteyian. Earl Shorty, a resident of Louisiana, moved into a FEMA travel trailer in one compound with his wife, Desiree, about a year ago. "Within four months after we moved in here, she just started coughing and she would get weak," Shorty told Keteyian. Earl says his wife didn't smoke and that every time she left the trailer the coughing would stop. Eventually, she became too weak to go out. On July 2, she took her last breath at a local hospital. "She was just looking at me and she said, 'Babe, I'm scared,'" said Shorty. "That's the last thing I remember her telling me, that she was scared." Formaldehyde, sometimes found in building materials used in manufactured homes, can cause respiratory problems and possibly cancer in high doses. FEMA provided more than 120,000 trailers to victims of the 2005 hurricanes Katrina and Rita, and many thousands of people still occupy them, especially in Louisiana, Mississippi and Arkansas. Formaldehyde is used in a number of materials in the trailers, including the particleboard used to make walls and cabinets. When complaints of possible formaldehyde poisoning surfaced in early 2006, FEMA officials tested one occupied trailer and announced "there is no ongoing risk" for trailer users. But documents show the levels of formaldehyde found were higher than those considered safe by several government health and environment agencies. The committee unearthed documents in which one FEMA lawyer advised: "Do not initiate any testing until we give the OK. ... Once you get results ... the clock is running on our duty to respond to them." When they finally, under pressure, tested some trailers for formaldehyde levels, they instructed the owners to keep all doors and windows open and keep air conditioners running around the clock for several days before the tests — which still came out high, reports Fuss. Formaldehyde is a carcinogen, and the fumes can irritate the eyes, nose, throat and skin. Lindsay Huckabee of Kiln, Miss., said she, her five children and her husband all have experienced symptoms of formaldehyde exposure. "I began to having migraine headaches and pre-term labor," Huckabee told the panel. "My daughter, who had been asthma-free for about a year, began having asthma attacks. Three of my children began having nosebleeds several times a week." Keteyian interviewed Katrina victims who'd been living in FEMA trailers — built for weekend trips — for extended amounts of time. FEMA trailer residents complained of symptoms in themselves and in their children. "Pretty much just the constant coughing," Angela Orcutt told Keteyian about her young son Nicky. "He would just — you could hear it, just in his chest." There are no federal standards for formaldehyde. The Environmental Protection Agency recommends a workplace exposure limit of .1 parts per million, reported CBS News. Last year, the Sierra Club tested 31 travel trailers in Mississippi and found that virtually all — 94 percent — had levels of formaldehyde above that limit. CBS News discovered an internal FEMA document that cites cancer as a potential job hazard for those just inspecting the trailers. "[This] should energize us to demand accountability and push for the reforms that will clear the air and improve the nation's emergency response capabilities," Rep. Tom Davis, R-Va., said Thursday on Capitol Hill. American Academy of Pediatrics pediatrician Scott Needle, M.D. from Hancock County, Mississippi, said he's seen a pattern of formaldehyde exposure illnesses from his patients. "In spring 2006, certain patterns of illness immerged amongst some of my patients. Many children returned repeatedly to my office with symptoms that would not go away or would clear up and then promptly reoccur. Sinus infections, ear infections, cold and a variety of other respiratory symptoms," Needle told the House panel. "In talking with these families I found that they shared two common characteristics. First they were all living in travel trailers provided by FEMA. Second the families reported that these symptoms started not long after moving into these trailers."